The administration said in the same email that they considered a pairing, “a lock in process or party.” Despite the administration not fully understanding what a pairing entailed, they still created a new rule that was not rooted in any pre-existing policy stated in the DePauw Student Handbook. 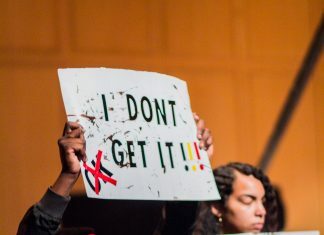 The proposed “cease and desist” was meant to be a pause in the New Member process so that the University could review the situation and determine the correct disciplinary and educational solution. Although we are aware of this meaning, the email did not clarify what exactly a cease and desist entailed and certainly did not define it as a pause. We recommend that DePauw University Administration improve its communication with the leaders of Greek organizations in order to clarify what the administration is concerned about (in this case, pairings). The larger issue with this scenario is that the “cease and desist” used as a possible added consequence this past weekend is not embedded in any pre-existing policy. Nowhere in the student handbook does it say that organizations that host unregistered parties are subject to be put on cease and desist of their new membership process. In fact, organizations that host unregistered non-alcohol events are subject to a formal warning, while unregistered alcohol parties are subject to review, according to the DePauw Student Handbook. We understand that the consequences of each situation may vary; however, we do not believe DePauw took the correct action when making a blanket statement, threatening a cease and desist as a possible consequence for both unregistered alcohol and non-alcohol events. It is clear that DePauw has an obligation and priority to keep all of their students safe; however, the DePauw administration should consider the unintended consequences that may come about from creating new rules that are not rooted in pre-existing policies, especially when the rules affect an entire organization. Could creating more rules and not explaining them make a student less likely to use the Medical Amnesty Policy, or call for help? To summarize, we believe the DePauw administration should improve three areas of communication. First, consistently enforce policies that are pre-existing, and when new rules are created, add them to the student handbook. Second, clearly explain to students any new rules and the rationale for implementation. Lastly, stop making assumptions about Greek organizations’ activities and directly address those in leadership positions with issues. In this case, the administration met with student leaders after they had already sent out the email regarding pairings to try to clarify confusion, which is counterproductive. We believe these changes will reduce miscommunication that leads to issues regarding Greek activities and reduce the risks of unintended consequences.